Crash Bandicoot ATTENTION ALL CRASH FANS!!! Now back to info about the marathon. Besides the games and the dares, we've got other ways to make the marathon fun. We're allowing the viewers to request songs, request dares, and request someone to sing one song. But the only way you'd be able to do that is if you donated a certain amount of money. But don't worry. You'll only have to donate a dollor or 3. We're not very sure if we'll do this or not but we might have some raffles that you can enter for prizes. There will be one prize per game and you can only enter once per raffle. Our ideas for the prizes are that there will be a crash bandicoot T-Shirt and some other piece of merchandise given out for the crash games and during the extra game the prize will be a Japanese copy of a PS1 Crash game. It might be CTR. 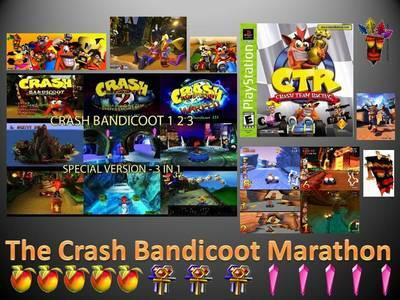 The Crash game raffle entries will cost $5 each and whoever donates the most money will be the winner of the Extra Game. Well thats it! A date has not been chosen but expect it to be a weekend in Aprill, 2011. The date may be changed to the first weekend in May. Im not very sure. Its gonna be live broadcasted on link HOPE TO SEE YOU THERE 'CAUSE THIS IS SOMETHING YOU WILL NOT WANT TO MISS!!! yo man thanks i was kinda getting impatient but thx!! !i was confused and thanks for entering me in the raffle for free i REALLY appreciate it sice i really want a crash t shirt it sounds great i'll totally watch it but try and find an exact date pls cause i dont want to DARE to miss it i'll be so upset if i do goodbye! where is it located in florida or somewhere else? Any one can watch it. Whether they be in the US or CHINA!!! We are broadcasting it in TX but its an online broadcast so it doesn't matter where you're from. You can still watch it. Sorry it took so long for me to reply to your question. We have been BUSY!! I mean, we're still trying to find a place to get the T-shirts done. I hope that answers your question though.